Use these instructions to configure the Robot Browser Interface portal server to send and receive information using Secure Sockets Layer (SSL). SSL technology encrypts (encodes) the communication between web browsers and the portal server. This encryption provides security against unwanted access to usernames, passwords, or other sensitive information. If you plan to provide access to the portal server via the Internet, we recommend using SSL to communicate with the portal server. Before you start the process to configure SSL, make sure that the portal server is not running. Go to the directory where the portal server is installed. Locate the directory where Java 5 or 6 is installed on your server (see the table below). Then, locate the executable file called keytool in the specified subdirectory. UNIX Talk to your UNIX administrator. Or, view the startPortal.sh file to determine the location for JAVA_HOME. Enter the full keytool command for your environment (see the table below). You must first go into QSHELL (enter QSH on an IBM i command line). Where: JAVA_HOME is the directory where Java 5 or 6 is installed. When prompted for a password, enter a password and remember it. After you enter and confirm your keystore password, enter your company’s information and location at the various prompts (for a sample, see the table below). When you are finished, a file called keys should exist in the current directory. Make a note of the path to that file. Open the file server.xml so you can edit it. This file’s location depends on the directory where the portal server is installed (see the table below). * On UNIX systems, this is the usual location for the file. If the server.xml file is not located here and you cannot locate it, contact your UNIX administrator. Save your changes and exit the server.xml file. Where someserver is the name or IP address of your portal server. Note: The URL must start with https, not http. When you connect to the portal server for the first time, your web browser should display a site certificate dialog (see the examples). Click Yes or OK to display the Portal Login page. Note: Some versions of Netscape may ask a second question. Click Yes or OK.
After you have SSL setup and working, you can disable the non-secured port, if you choose to. Ensure your web server is active by running the PORTSTCFG command from the command line. If not running, start the server by running the PORSTARTUP command on your IBM i. If it is running, go to the step 2. Go to the non-secured URL (http://server_address:8008). If this does not display the signon screen, contact Technical Support. If it does display the signon screen, that means that the RBI setup is OK and there may be a problem with your Internet options. SSL uses the TLS protocol when the web server is the IBM i. This needs to be activated in the Internet options of the web browser that is being used to access Robot Browser Interface. Where this setting is located will depend on what you are using for your Internet browser. Many times the error page that the browser software displays will list some things to look at to ensure the Internet options are correct. Follow the instructions to see if you can find where you define to use TLS. Scroll down and ensure that the “Use TLS 1.0” box is checked. If not, check it and click Apply. 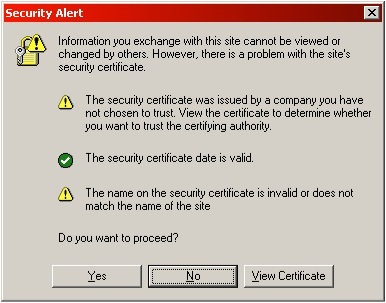 Then, click OK.
You may get a window stating you need to accept this certificate. Respond to this dialog and the Robot Browser Interface signon page displays. Note: When defining SSL on a Windows machine, this didn't seem to be a problem. The Windows and UNIX environments use SSL differently.